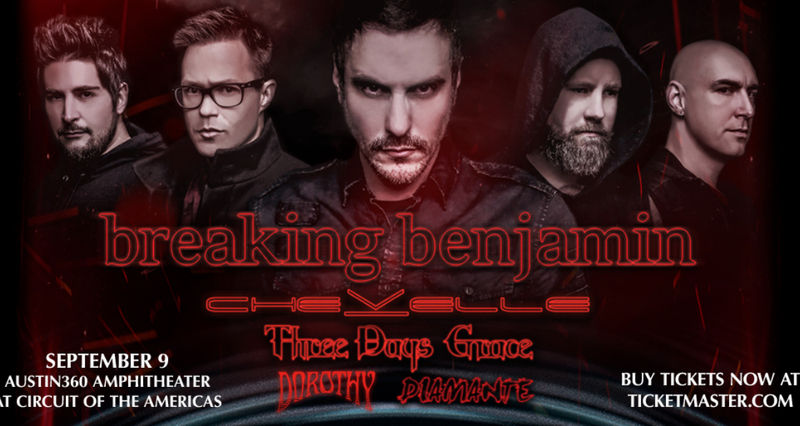 Tickets On Sale To General Public Starting Friday, February 22 at 10 a.m.
AUSTIN, TX (Feb 19, 2019) – Multi-platinum rock band Breaking Benjamin have announced their massive 2019 headline tour across North America this summer. A stacked line-up of special guests will join on select dates including Chevelle, Three Days Grace, and Diamante. The band is currently set to kick off a slew of arena dates beginning March 15th and wrapping April 10th before the extensive summer trek. Produced by Live Nation, the 35-city outing kicks off July 21st in St. Louis, MO at the Hollywood Casino Amphitheatre and will make stops in Detroit, Atlanta, Austin and more before wrapping September 25th in Salt Lake City, UT at USANA Amphitheatre. The tour stops in Austin on Monday, September 9th, 2019 at Austin360 Amphitheater at Circuit of The Americas. See full itinerary below. Tickets for the Austin performance go on sale to the general public beginning Friday, February 22nd at 10 a.m. local time at Ticketmaster.com.